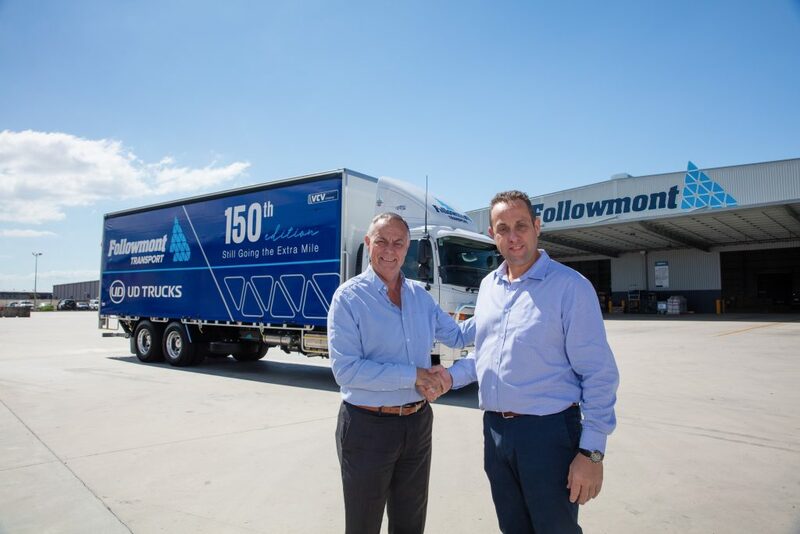 UD has announced a significant milestone with one of Queensland’s largest freight companies Followmont Transport taking delivery of its 150thUD truck. Followmont Transport managing director Mark Tobin said the 150 th truck is another spoke in the wheel of their relationship with UD. “Taking on our 150th UD just goes to show the growth of our business and the strength of our operation,” said Mr Tobin. Followmont Transport says it clocks up more than 85,000km everyday, moving 3,000 tonnes and delivering 99 per cent in-full and on-time. “We need reliable and dependable products and find the UD is a truck suited to support our growth, making our jobs easier,” saidMrTobin. “We have a commitment to our customers to always go the extra mile and be relied upon for their transport needs, so we need equipment that is fit for purpose and UD Trucks provide the right product for our business, said Mr. Tobin. Vice President of UD Trucks Mark Strambi presented Mark Tobin with the keys to the new truck, acknowledging the close relationship. “As a passionate family business Followmont Transport is 100 per cent dedicated to service and hands-on relationships. These values hold the same importance for UD Trucks; our ethos is to always go the extra mile in every thing we do,” said Mr Strambi. Followmont’s operates 383 trucks so UD makes up a little under half the vehicles on the company fleet and it says it has purchased an average of 12 to 15 UD trucks per year, from small rigids through to 60 tonne GCM prime movers. VCV Brisbane North’s Stuart Blackmore said of the 150 trucks purchased over the many years of the relationship, 123 are still currently active and on the road. Mr Tobin said that he’s been really impressed with theUD Trucks’ Quon. “UD has been able to retain the cost value, considering the safety and product improvements. I can’t fault them,” he added. Mr Tobin says the fuel economy makes them a smart and economical investment for local runs and short linehaul too. “Fuel economy is in excess of two kilometres per litre and Ad Blue usage is below 3.5 per cent,” he said. Tobinisextremely passionateabouthispeople andcreatingaworkenvironmentwhere everyone isproud tocometo eachday –andthisincludes havingtheright trucks. “Our drivers enjoy getting behind the wheel; our UDs provide good visibility, easy entry and exit for the driver and a turning circle that’s a good fit for the work that is carried out,”said Mr Tobin. VCV’s Stuart Blackmore said theUD Trucks’ team is focussed on maintaining their strong relationship with Followmont in to the future.